The George Washington University Student Association (known as the GW Student Association or SA) is the student government of the George Washington University in Washington, DC. The SA is responsible for advocacy on behalf of the GW student body at and is modeled after the U.S. Federal Government and consists of three branches: legislative, executive and judicial. The origins of GW's Student Association trace back to 1909, but the current structure dates to 24 May 1976, when the current constitution was adopted by university-wide referendum, which established the Executive Cabinet, the Senate, and the Student Court. Numerous alumni of GW's student government have gone on to pursue prominent careers in politics, such as Edward David Burt (youngest ever Premier of Bermuda), in diplomacy, such as Ambassador Edward Gnehm (Presidential Distinguished Award winner), and in the private sector, such as Neil Portnow (current president of The Recording Academy). In 1909, a student representational system governed by various class presidents or officers was founded. In 1930, the previous system was abolished in favor of the creation of the GW Student Council. All schools in 1930 were to receive one representative for every 500 students. In 1938 the constitution was changed. The new Council was composed of 9 members elected of the student body at large and 5 members from various student groups. It was given the following powers: 1) to make rules governing elections, 2) to classify activities as "major" or "minor," 3) to require major activities to file prospecti covering their programs for each year, 4) to prescribe systems of accounts and records for any activity, and, 5) to make rules providing appropriate penalties for violation of any rule, regulation, or order of the Council. The Council system, with modifications (it later became known as the Student Assembly), continued until February 27, 1970, when 69% of the student body voted in a referendum to dissolve the student government. Student Assembly president Neil Portnow ran for reelection with the abolition of the Assembly as the major plank of his platform. He won, and on February 17 read a statement to The GW Hatchet and other press announcing the abolition of GW's student government. It wasn't until 1974 that a referendum to bring back some form of student government was initiated, and in January 1975 students voted to create a new governing system by a five to one margin. The George Washington University Student Association came into being in April 1976 when students ratified a new constitution by a vote of 1,343 to 241. On May 24 of that year the Board of Trustees ratified the Student Association charter. Membership included all full-time, part-time, graduate, professional and undergraduate students who were registered for academic credit. Today, the Student Association is made up of the executive, senate and judicial branches. Starting in 2010 the SA focused on reducing printing fees after charges were leveled that the University was profiting off of students. After having little success the issue was again taken up in 2011 with the formation of a joint committee of students and faculty after stonewalling from the university administration. Second semester of the 2011-2012 academic year there was again another vow to renew the fight against student fees. Eventually, the fee was reduced. Other advocacy efforts have included the restoration of free news papers to student after they were cut by the University. There was also a push to ban smoking on campus by the Senate that led to a campus wide referendum that passed overwhelmingly, but needs to be enacted by the administration. The Student Association has also successfully lobbied for the installation of condom dispensers in residence halls. The Executive Cabinet is the executive branch of the SA. The President and Executive Vice President (EVP), elected on separate tickets by the 25,000 graduate and undergraduate students, oversee the Executive Branch, which consists of the Executive Cabinet and several subordinate entities. The 2018-2019 SA President is Ashley Le and the 2018-2019 SA Executive Vice President is Ojani Walthrust. They began their terms after a swearing-in ceremony on 3 May 2018. The President appoints ten Vice Presidents to the Cabinet upon confirmation by a two-thirds vote of the Senate. The President also holds the power to appoint Directors at will and create or eliminate director positions at will. The Senate is the SA holds the power to approve bills that are sent to the President, as well as control the Student Association's $1,778,704 budget. The Senate consists of thirty Senators representing their respective schools within the university, as well as three non-voting freshmen Senators. The Senate consists of four standing committees that include the Finance Committee, Student Life Committee, Academic Affairs Committee and Senate Leadership Committee. The Senate has the mandate of making recommendations on issues that affect student life, give general direction to Student Association policies, collect a student fee from tuition and subsequent disbursement, and passing of bills as it sees fit among other powers. The current President Pro Tempore of the SA Senate is Brady Forrest. The Finance Committee is in charge of the funds that the Senate collects from student tuition to fund the Student Association budget, collecting just over $1,700,000. These funds are primarily doled out to the over 500 student organizations on campus at The George Washington University in addition to funding the operational budget of the Student Association. The Committee is responsible for setting criteria for disbursements and working with the Vice President for Financial Affairs, a member of the President's cabinet. In 2012 the Finance Committee put a Student Fee Increase to a student body referendum. The proposal sought to increase the amount the SA collects from students to $3.00 per credit hour from $1.50 per credit hour, boosting the SA budget to an estimated $1,750,000 over nine years. The referendum was ratified by the student body with 66% voting in favor. The Student Life Committee is responsible for advocating on issues that affect students. Primarily, the Committee raises these issues at Senate meetings and proposes bills to be used as the basis for advocacy efforts. The Academic Affairs Committee primarily focuses on issues that relate students academics. The Committee works closely with the Faculty Senate and university administration to address relevant issues. The Judicial Branch consists of the Student Court, composed of five members, two of whom must be undergraduate and two graduate students. Members of the Court serve for their entire academic career after being appointed by the President and confirmed by the Senate. The court has jurisdiction over any cases the involve suits brought between parties within the Student Association and between other student organizations suing the Student Association. Presidential candidate Kyle Boyer won the popular vote, but was charged with a violation of election rules for failing to report the market value of a car used during campaigning. Julie Bindleglass lost the popular vote, but became President of the SA when the Joint Election Committee, active during elections, threw Boyer off the ballot. Boyer then sued the Joint Elections Committee in the Student Court. The Court used a 1992 precedent in which Presidential candidate Christopher Ferguson alleged he was thrown off the ballot in an "arbitrary and capricious manner", criteria for bringing a case to the court, as precedent for hearing the case. The Student Court upheld the disqualification from the ballot and effectively decided the outcome of the election. 2019-2020 SJ Matthews Amy Martin SJ Matthews won the run-off election, after an inconclusive general election. 2017-2018 Peak Sen Chua Sydney Nelson After the Presidential election was delayed and later cancelled, Chua, then EVP-elect assumed the presidency and nominated Nelson to be his Executive Vice President. 2016-2017 Erika Feinman Thomas Falcigno Feinman and Falcigno previously served as SA senators. 2015-2016 Andie Dowd Casey Syron/Thomas Falcigno Falcigno substituted Syron after mid-term resignation. 2014-2015 Nick Gumas Avra Bossov Gumas elected as first openly gay President. 2010-2011 Jason Lifton Rob Maxim Lifton previously served as EVP. 2009-2010 Julie Bindelglass Jason Lifton Bindelglass elected as 3rd female President. 2007-2008 Nicole Capp Brand Kroeger Capp elected as 2nd female President. 2000-2001 Edward David Burt Burt later became the youngest ever Premier of Bermuda. 1999-2000 Phil Meisner/Caity Leu Caity Leu/Kim McGraw Meisner impeached, with EVP Leu assuming the Presidency and appointing McGraw. 1987-1988 Adam Freedman Freedman 1st President to serve two terms. ^ "The George Washington University Enrollment Dashboard". The George Washington University Office of Institutional Research & Planning. Retrieved 2016-08-29. ^ " About the SA by The GW Student Association". 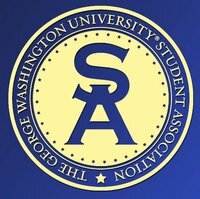 gwstudentassociation.com. Archived from the original on 14 October 2007. Retrieved 22 March 2015. ^ a b "Student Organizations: Student Government". gwu.edu. Retrieved 22 March 2015. ^ "Fees on the table for SA task force". gwhatchet.com. Retrieved 22 March 2015. ^ "Student Association leaders renew fight against fees". Newsroom. Retrieved 22 March 2015. ^ "SA returns free New York Times to campus". gwhatchet.com. Retrieved 22 March 2015. ^ "Senators call for free condoms in residence halls". Newsroom. Retrieved 22 March 2015. ^ "Student Association Senate - GW Student Association". gwu.edu. Retrieved 22 March 2015. ^ "Senate Committees". gwu.edu. Retrieved 22 March 2015. ^ "Fee hike would boost SA budget to $1.75 million, cost about $90 per student within decade". Newsroom. Retrieved 22 March 2015. ^ "Student referendum approves fee increase". Newsroom. Retrieved 22 March 2015. ^ "Boyer appeals disqualification to Student Court". Newsroom. Retrieved 22 March 2015. ^ "SA President-elect Ashley Le". George Washington University Student Association. Retrieved 29 March 2018. ^ "SA Executive Vice President-elect Ojani Walthrust". George Washington University Student Association. Retrieved 29 March 2018. ^ "SA President Peak Sen Chua". George Washington University Student Association. Retrieved 19 December 2017. ^ "SA Executive Vice President Sydney Nelson". George Washington University Student Association. Retrieved 19 December 2017.